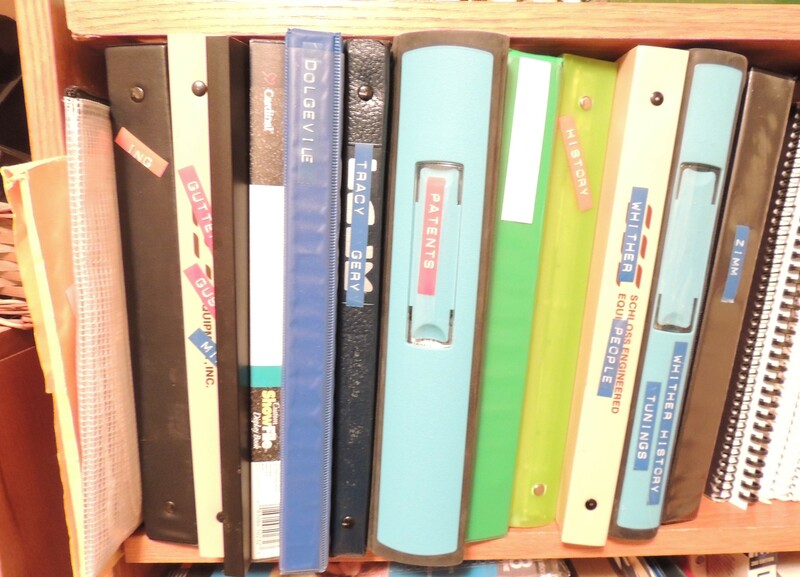 An “arial view” of my autoharp research notebooks; as you can see, many are full. And there’s more in my PC! 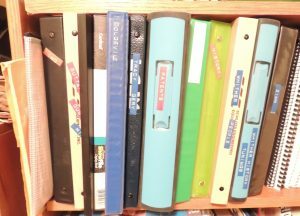 Help Me Find Autoharp Instruction Books! December, 3, 2018: Lately, I’ve been on the lookout for all kinds of materials, old and recent, relating to the history of the autoharp and autoharpING (meaning how it’s played). 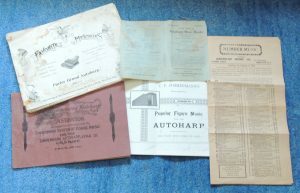 “Old autoharp paper” didn’t mean to become an obsession but did so around April 2018 (see left; the oldest piece, bottom center, is a copy of a book published in 1885). On October 4, 2018, I also began to generate a 108-page autoharpING timeline in connection with a GD-diatonic bass-tuning study I’ve been working on for the last 3+ years (you’ll hear more about this soon, as it’s on the last round of writing). Most of the info on the timeline comprises quotes from over two dozen instruction books published from 1885-2005, about set-up, picks, techniques, just about anything relating to playing the autoharp. There are more books that I don’t have that I’d like to account for in the timeline and hope to get a look at soon. To find out all I could about autoharpING (the subject of autoharps themselves is already well covered; no point re-inventing the wheel), I asked, for example, a few autoharping friends if they owned a particular title I might get a look at. All of them had thrown their copies of that title away! Yikes! I could have used one for reference, if only they had known. Yup, this is an overly full box! Consider donating a book to the cause of autoharp research. * Click here to see the Archives List (the first page explains how everything is arranged). The List is updated periodically as more materials come in (the date at the end of the file title shows when it was last updated, as well as on page 1). On the other hand, if you’ve got a really old book you prefer to keep that I don’t have, I’ll be happy with a scan or photocopy. *Big thank yous to Jim Hill, Paul Ranney, Eileen Roys, Charles Levy, Mike Fenton, Robin Anderson, June Fessenden, Nancy Hay, Louise and Ted McClure, Marc Tan Creti, Meg Peterson, Steve Braden, Richard Switzer, Midori Hall and Rick Meyers–so far! My email address appears at the top of each page of the Archives List (take the spaces out and change “at” and “dot” to their usual characters before you send your message) so that you can contact me sooner than later about whatever you have. Spine view of all of my research notebooks, including yet more contents in the two large envelopes at far left.